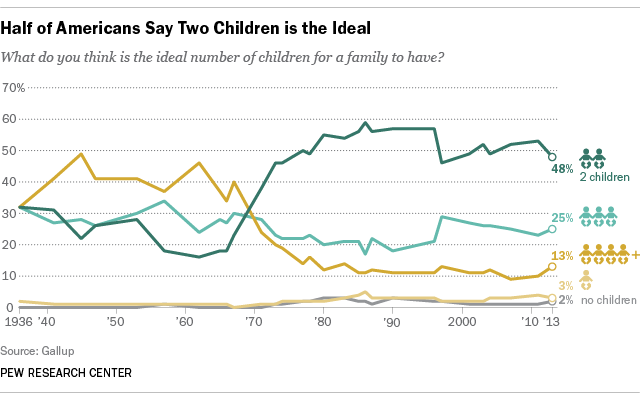 Half of Americans (48%) say two is the ideal number of children for a family to have, reflecting a decades-long preference for a smaller family over a larger one. What’s behind the dramatic shift? Likely a number of factors, beginning with the wide availability of the birth control pill in the 1960s; the growth of women’s participation in the workforce, which surged in the 1970s; and, of course, the increasing cost of raising kids. When Gallup asked why couples aren’t having more kids, most Americans (65%) in 2013, whether with or without children, cited the costs associated with raising a child. An additional 11% said it’s because of the state of the economy and the jobs situation. Just 6% cited personal choice, 3% cited lack of time and 3% cited career concerns. The average cost of raising a child, from birth until they reach age 18, has risen over the decades, from $198,560 in 1960 to $245,340 in 2013, according to the U.S. Department of Agriculture. (Those figures are adjusted for inflation and are calculated for raising a child from ages 0 through 17 in a middle-income, two-parent family.) Housing, followed by child care/education and food, were the largest expenses in 2013. Modern parenting in general is also much different from what it was just a few decades ago, according to a 2013 Pew Research Center report. For one, mothers today are much more likely to be working. 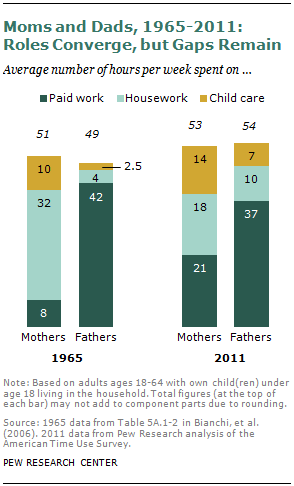 The share of mothers in the labor force (with children younger than 18) rose to 71% in 2012, from just 47% in 1975. Meanwhile, “traditional” roles for mothers and fathers are eroding. Comparing data from 1965 and 2011 shows that mothers these days are spending more hours per week at their jobs, and fathers are spending more time doing housework. Both mothers and fathers are spending more time on child care, though mothers still do more of this than fathers do. Not only do Americans say smaller families are more ideal, they’re also having smaller families. 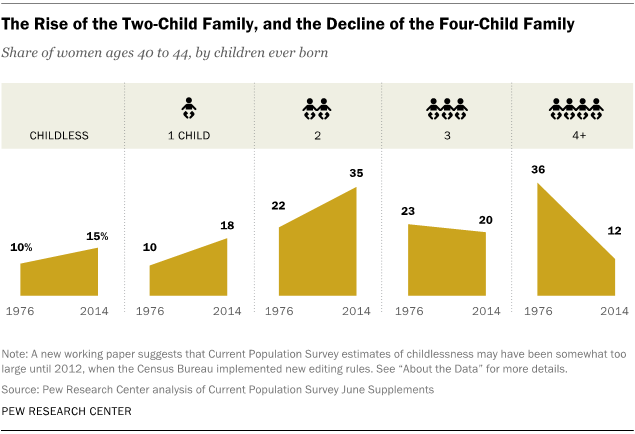 In 1976, 36% of women in their early 40s had given birth to four or more children, while just 22% gave birth to two children, according to a new Pew Research Center report. But according to 2014 data, it’s more common nowadays for women of the same age to have two children: 35% gave birth to two children, while just 12% had four or more.